….ultimately there are almost infinite different forms of music most of which have been produced as a result of, or have been affected by African music on some level. Whether Western instruments have evolved from ancient African forms, or we have adopted knowledge in terms of rhythms and cross rhythms, various scale patterns, or simply the evolution of melody and harmony, Western music undoubtedly owes an immeasurable debt of gratitude to our African brothers and sisters for their wisdom, insight and creativity. Following the Civil War, black Americans, through employment as musicians playing European music in military bands, developed new style of music called ragtime which gradually evolved into jazz. In developing this latter musical form, African Americans contributed knowledge of the sophisticated polyrhythmic structure of the dance and folk music of peoples across western and sub-Saharan Africa. Together, these musical forms had a wide-ranging and profound influence over the development of music within the United States and around the world during the 20th century. The most important influence on 20th century music? African Americans and the musical culture they brought to this country – developed within the bonds of slavery. Even before the 20th century began, blues music was evolving across the country out of the traditional African slave spirituals, work calls and chants. Of all the developing genres, the blues would be the most far-reaching, with its influence felt in everything from jazz to rock, country music to rhythm and blues, and classical music. That said, jazz’s influence on the world music scene would be nothing short of transformational. My thoughts….Obviously, the “European Spirit”, and the spirit of other peoples as well, have also contributed to what we generically call the “American Spirit”, but I wish to highlight the importance of the contributions of Native Americans and African Americans. In the formation of that collective spirit, the American experiment of the “melting pot” has been a most astonishing success, the blending of all these diverse influences into a collective force that has had such a dramatic impact upon the rest of the world. But in terms of the peoples themselves, our melting pot of peace and harmony is turning into a crucible of strife and discord. My point of this post – it is so terribly astonishing that two of the peoples that have had such a profound influence upon two of our most cherished cultural phenomena – our system of government and our music – with which we all identify so much – that these two peoples should be so under-valued, to continue to suffer so much from the bias of the dominant culture….This unrelenting injustice elicits such deep sadness, that words cannot express…. 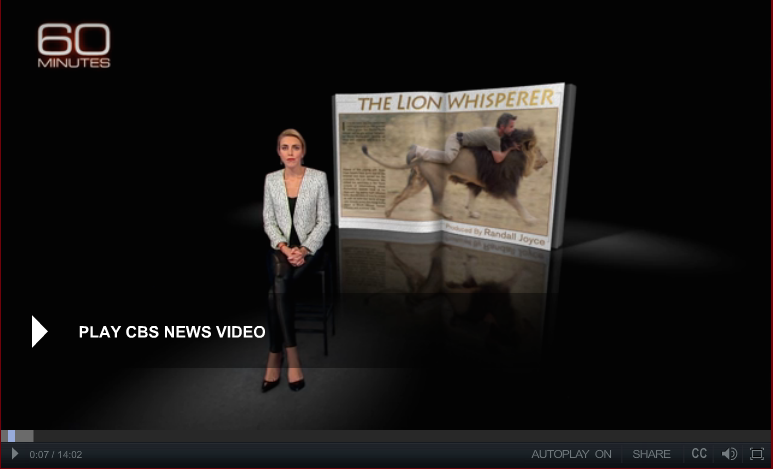 Continuing to explore the Lion energy…. Here is a very fascinating, and very troubling, news report. I don’t usually blog about my dreams, but as I was dreaming last night I said to myself in the dream, “I’ve got to post this on my blog.” So I guess I must. In the dream it’s night-time and I’m driving my car through an unknown city, but in that dream consciousness it was familiar, my home. There is a woman sitting in the passenger seat next to me. Again, unknown but very familiar. As we’re driving, we notice on a side street this huge, looming shape lurking in shadows – immediately recognizable as the silhoutte of a male, African Lion. There was no fear in the recognition, just a realization that the world had changed, and the presence of lions was now to be expected. The lion leapt out of the shadows and ran in front of the car, illuminated in the darkness by the headlights. 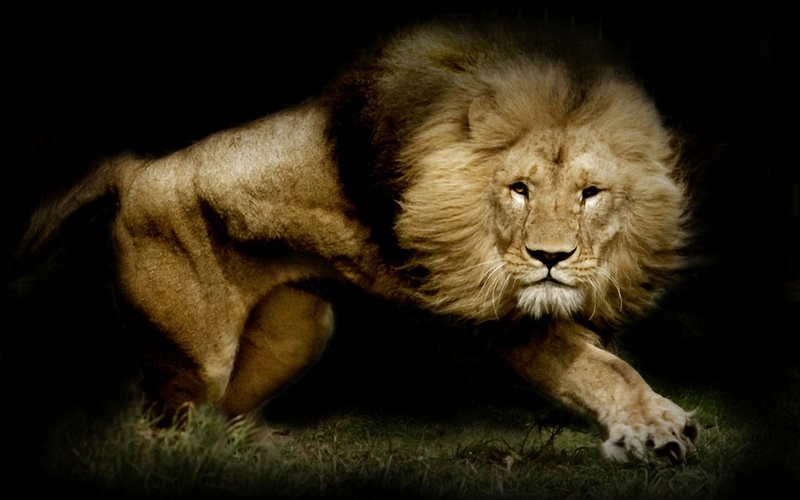 The lion was bigger than life, and the very image of power and strength and grace and ferocity. I pulled out my iPhone and snapped a picture of it (much like the picture above). 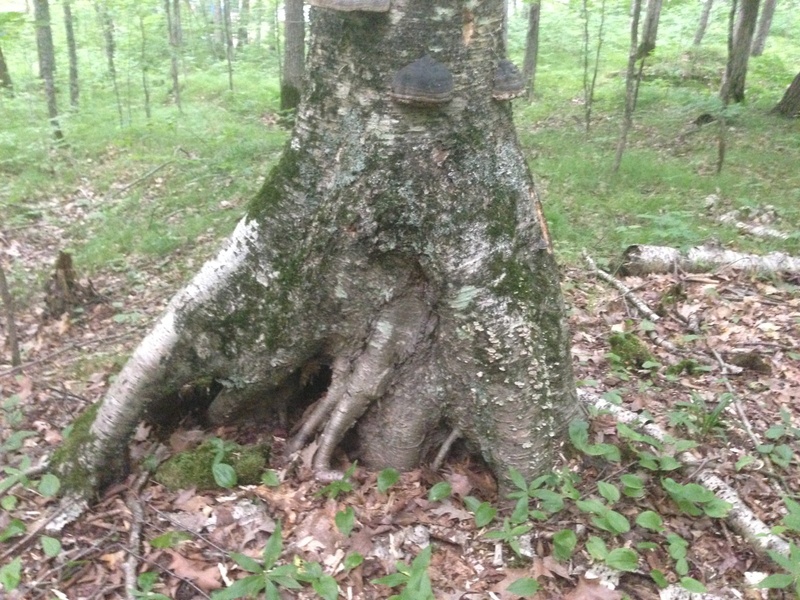 Builders of treehouses will know that one major consideration during construction is how to support the structure without harming the tree. There are specially developed fasteners and bolts for the task, but there may be ways to hold things up without drilling even a single hole. 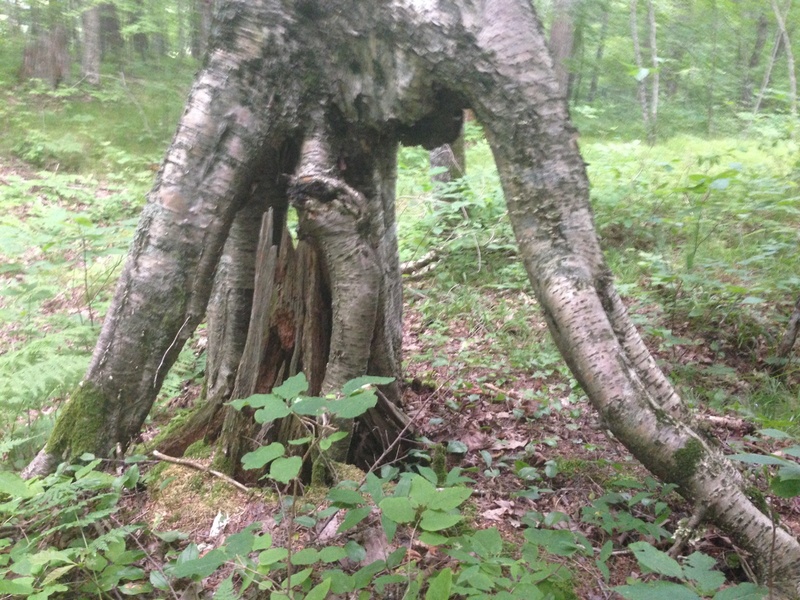 That’s the idea behind CanopyStair, a modular staircase that wraps around a tree’s trunk, without damaging it. Designed by Royal College of Art graduates Thor ter Kulve (previously) and Robert McIntyre, the CanopyStair features curved, birch plywood treads that are progressively attached around the tree trunk with ratchet straps, so that the stairs can spiral up into the leafy canopy. 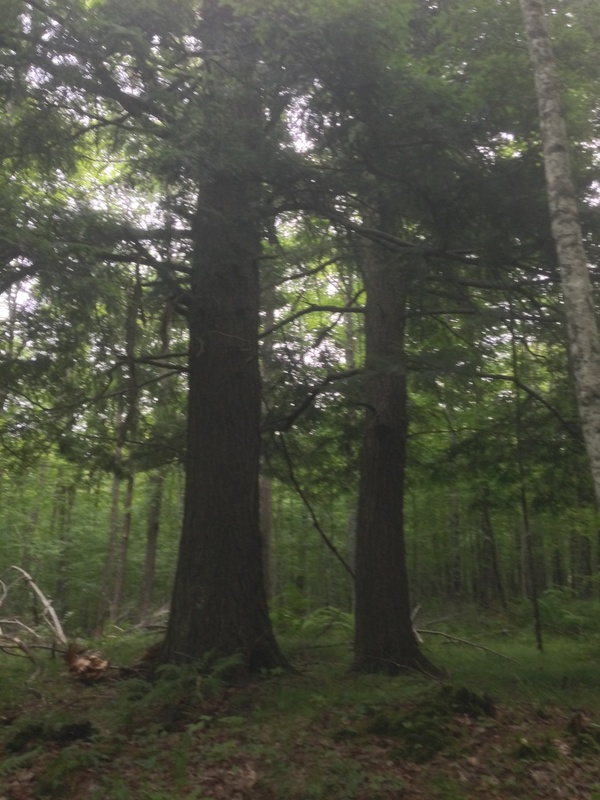 The old-growth Hemlock forests of northern Wisconsin were logged off in the late 1800’s into the early 1900’s. 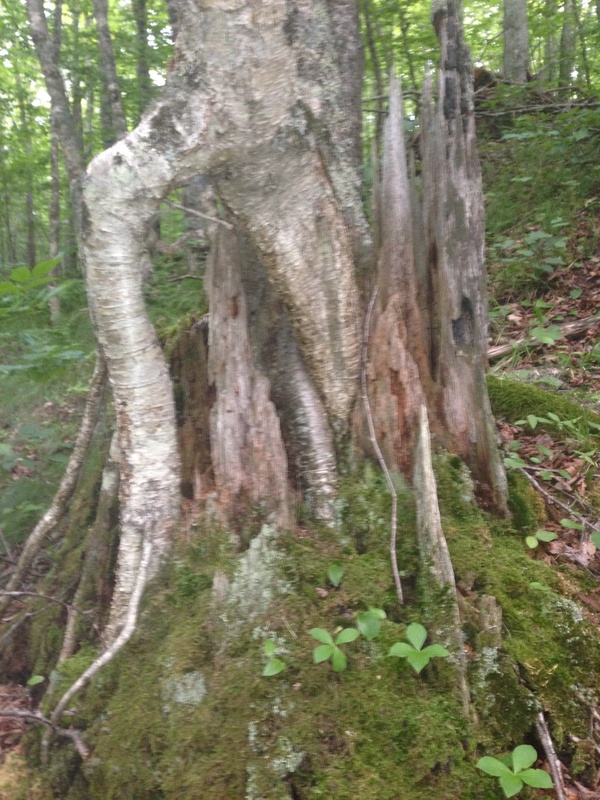 As time passed, Yellow Birch seedlings took root in the deteriorating Hemlock stumps. 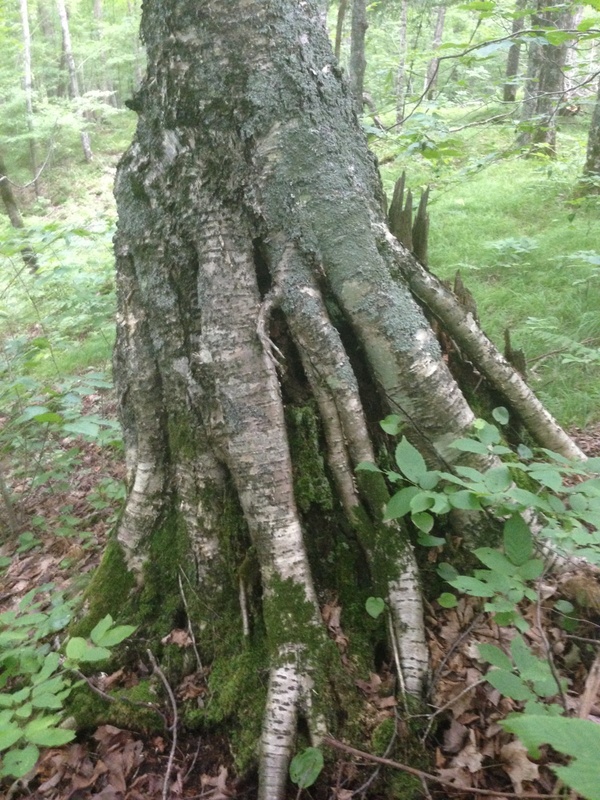 Eventually, as the stumps slowly rotted away, it left the roots of the Yellow Birch exposed. 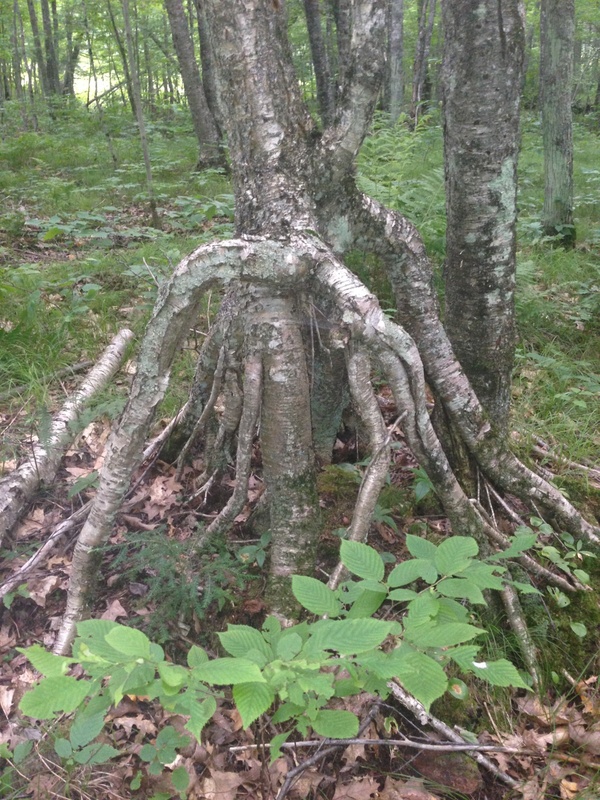 And so they now stand, raised up from the earth on spidery legs, looking as though they might skitter through the forest on moonless nights, or perhaps dance under the full moon. 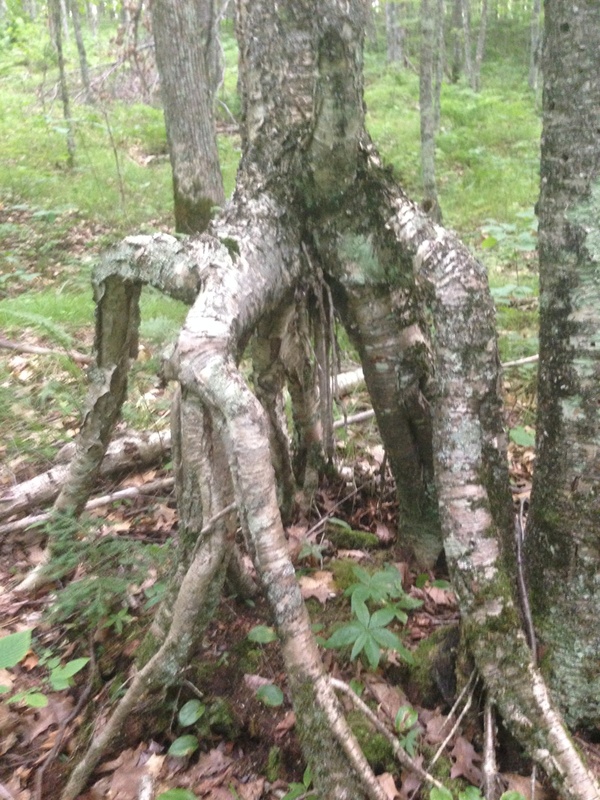 Two vestigal Hemlock Trees, growing where their ancestors once thrived and dominated the landscape. 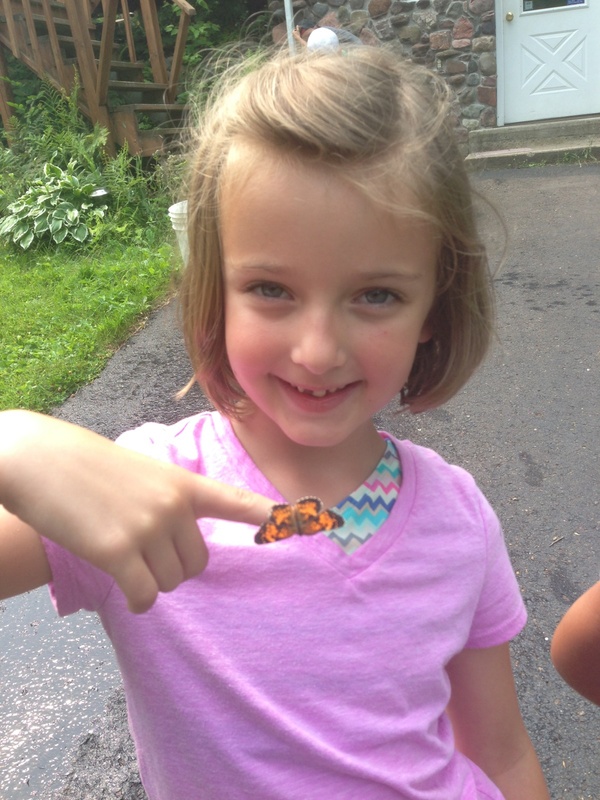 This butterfly was repeatedly drawn to my great niece, Sienna. Though, “great” doesn’t really do her justice, for she is actually very awesome! 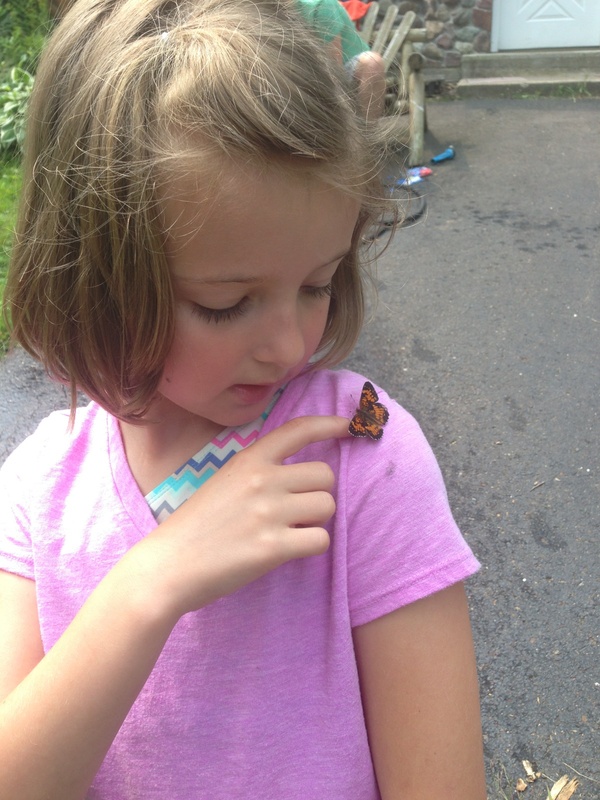 As many times as she gently placed the butterfly on a plant, it would find it’s way back to her. It was very magical. They were quite enamored with each other. As best I can tell, this is a “Silvery Checkerspot”, but if there is someone more wise in the ways of butterflies than I, please let me know if it is something different. If I may boast a bit about my niece…she has the most beautiful and amazing singing voice. Sometimes I think she will become a pop star. Other times I think she might become an opera singer. Other times I think she might become a blues singer, because she can already bend a blue note like nobody’s business.